Learning more about the true nature of your surrounding environment can be rewarding. Doing it in a tropical paradise like Hawaii can be a lot of fun. The islands are so interesting and so sensuous. Few destinations stimulate all of your senses more easily and more completely. It’s a place that makes learning about the Earth and its fragile, constantly evolving environments easy and enjoyable. As you review each of our 2013 educational programs and training seminars you will be introduced to some of Hawaii’s amazing attributes. 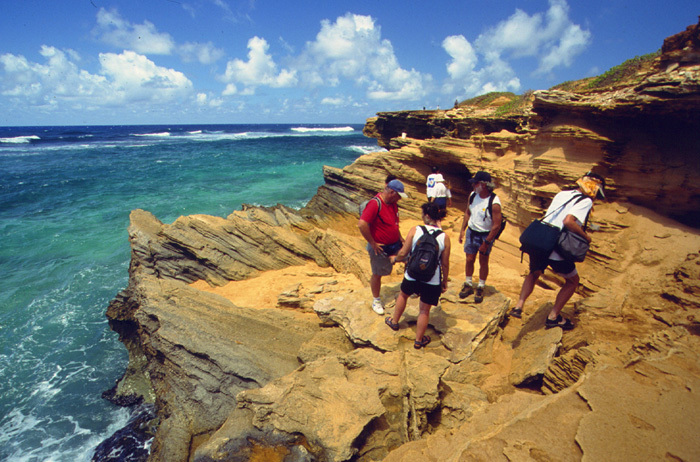 You will also notice that we provide educational experiences as many levels on the Kauai and the “Big Island” of Hawaii. Let us increase your environmental science knowledge base in these stimulating isolated island settings. All of our educational programs involve a mix of lectures that provide orientation and background and field excursions that provide for “hands-on” learning activities. You spend most of the time outside interacting with the environment, your trip leader and co-participants. Group transportation and on site engagement provide plenty of time for observation and discussion. When you traverse a field of fresh lava you will begin to understand more fully how shield volcanoes work. When you walk through a near native Hawaiian forest you will be guided to “see” more than just a beautiful mix of trees and understory plants. You will increase your understanding of isolated island evolution. When you walk along and examine a sandy beach your focus will allow you to observe more than a beautiful pile of sand. You will increase your understanding of geologic time and some of the Earth’s complex environmental processes. When you snorkel among the coral, fish and turtles of a shallow reef platform, where ocean meets land, you will learn to make observations that provide a deeper understanding of one of the planet’s most dynamic, but fragile ecosystems. When it comes to increasing your knowledge of the geology, ecology and environmental of and isolated mid-ocean volcanic islands, there is nothing like being there to have all of your senses stimulated. This week long, Kauai-based field seminar has been designed specifically for science educators. The program involves five days of orientation lectures, interactive field excursions and lesson-plan workshops. Emphasis is placed on the delineation and characterization of ecosystems, the recognition of their complex interconnected nature and the development of a better understanding of a variety of modifying influences of their human occupants. Seminar participants benefit from real world, active, field-based learning activities in ways that allow for more precise observation of the physical, chemical and biological processes that mold environmental systems. Such hands-on activities provide for the enhancement of their approaches to teaching Earth and Environmental Science. The origin of Hawaii’s mid-ocean chain of huge shield volcanic mountains within the geologic framework of plate tectonics. The natural destruction of volcanic mountain-island complexes by mass wasting, subsidence, weathering and erosion. Various aspects of the biogeography of oceanic islands, such as long-distance migration of plants and animals and isolated island speciation. Human interaction with natural environments, including the impact of agriculture, soil erosion, harvesting of ocean resources, and urbanization leading to pollution and degradation of entire ecosystems. Global climate change (natural and human induced) and resultant impact of sea level rise. Approaches to the conservation and preservation of ecosystems as well as more effective methods of human coexistence with the natural environment through better management of natural resources in order to establish a balance between utilization and replenishment. 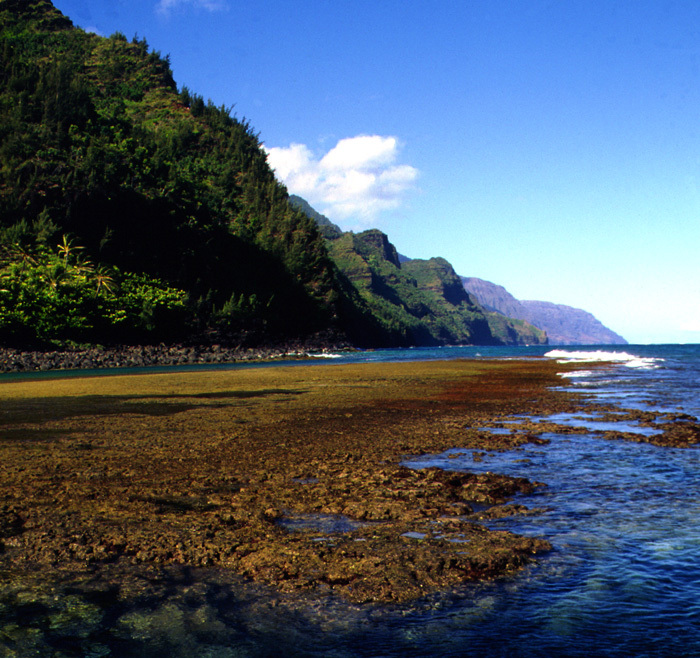 The island of Kauai is a perfect location to experience the character and interaction of a wide variety of environmental systems. Being the oldest of the main high volcanic islands of Hawaii, Kauai has had the longest time to develop distinct environmental systems. Mature ecosystems range from lush rain forests and mountain top bogs, to prominent erosional valleys, sunbaked coastal lowlands, fringing platform reefs, sandy beaches and rocky intertidal zones. The near-circular, 5 million year old, 30 mile diameter island displays a complex of interrelated ecosystems that are otherwise closed off from the rest of the planet by an extensive surround ocean. Even the early inhabitants, from Polynesia, recognized the importance of these interactions. They subdivided the island into roughly pie-shaped, watershed defined, parcels (each referred to as an “ahupua’a”) that provided its occupants access to the resources of the mountain, valley and coastal marine systems. With its abundance of interconnected environmental settings, its relative ease of access and low level of urbanization, Kauai is a world class island ecosystem model. Our week-long training program involves five days of orientation lectures, interactive field excursions and lesson-plan workshops. All sessions are conducted by scientists with international experience at university and post-graduate levels. Emphasis is placed on the delineation and characterization of ecosystems on the Island of Kauai, recognition of their relatedness, and development of a better of the modifying influence of their human occupants. This week long, Hawaii Island-based field seminar has been designed specifically for science educators. The program involves five days of orientation lectures, interactive field excursions and lesson-plan workshops. Emphasis is placed on the presentation and review of numerous basic principles of geoscience. Seminar participants benefit from this active, field-oriented learning activity in ways that enhance their approaches to teaching Earth Science and related topics. The principles of plate tectonics and volcanology – specifically, the origin and movement of Hawaii’s chain of huge shield volcanic mountains. Natural interaction of the Earth’s lithosphere, hydrosphere, atmosphere and biosphere – specifically in terms of the destruction of the Hawaiian Islands by processes of mass wasting, subsidence, weathering and erosion. Glacial deposits – their recognition, description and significance in terms of global climatic change, even in a high altitude tropical setting. Marine coastal environments – specifically the production of volcanic sediments, the growth and destruction of coral reefs, and the production of black, green and white sand beaches under variable shoreline settings. The hazards of living on a tectonically active volcanic island – including the dangers of volcanic eruptions, earthquakes and tsunamis. The history of the interaction of humans with a severely-isolated island setting characterized by an extremely wide range of ecosystems and climatic settings. It’s a common misconception that the geology of the Hawaiian Islands, especially the “Big Island” of Hawaii, is only about volcanoes. 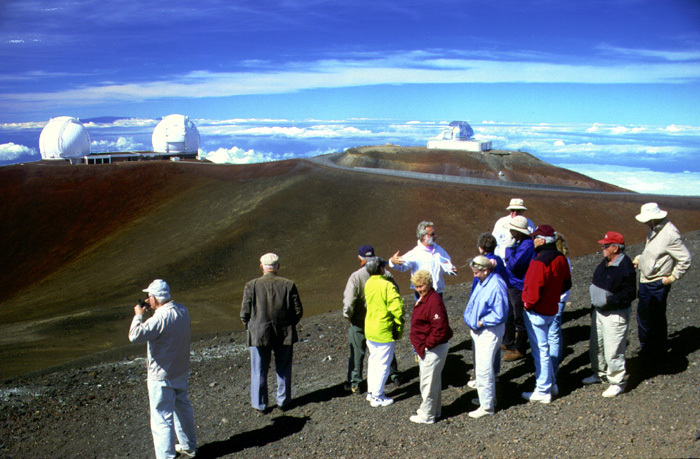 True, the Big Island does display the Earth’s largest volcanic mountain, Mauna Loa, its tallest volcano, Mauna Kea, and the world’s most famous active volcano, Kilauea; however, many other geological features are displayed as well. 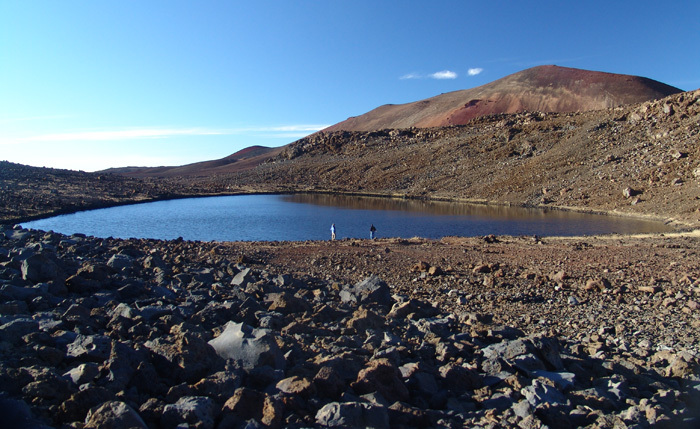 For example, glacial deposits above 10,000 feet on Mauna Kea represent several stages of glacier development during the Earth’s changing climate over the past 200,000 years. Huge submarine landslide deposits that cover major undersea portions of the volcanic mountains, and surrounding seafloor 15,000-18,000 feet below, represent the planet’s largest mass wasting features. Above sea level fault scarps are visible, especially along the flanks of Mauna Loa and Kilauea. Coral and stony algal growth in the island’s warm coastal waters result in the development of shallow marine reef structures. Erosion, transport and deposition of sediments is evident along the shoreline where ocean waves and currents produce volcanic black and green sand as well as the famous coral-rich white sand beaches. And, throughout the 450,000-year history of the Big Island, soils have been developing as a result of the interaction of the island’s volcanic rock materials with the atmosphere, hydrosphere and biosphere. The result of these many mid-ocean volcanic island geological processes is the ideal geoscience laboratory. Hawaii’s year round great weather makes it a perfect place to study the many aspects of geology. The Big Island Geoscience program provides science teachers the opportunity to upgrade their skills in earth science instruction. Here you will discover why the island of Hawaii and the Hawaiian Archipelago played such an important part in the last major revolution of thought in the earth sciences – the development of the theory of Plate Tectonics. In addition to observations of active volcanoes and their various molten rock products, you check out geologic faults representing major structural failures along the volcano’s growing slopes. You hike through Pleistocene glacial deposits and dig in soil layers. You snorkel among the beautiful corals of the island’s growing biogenic reefs and examine its various black (volcanic), green (olivine) and white (carbonate) sand beaches. During the many interactive field trips you can examine, probe, question, and discuss. You practice lesson-plan exercises that can be adapted to other geological settings. Geoscience comes to life here on the Big Island. You can be a part of that. This 5 to 6 day, two-island field workshop has been designed specifically for high school and college level educators. It provides an opportunity to gain first hand knowledge of the geological origins and environmental systems of the Hawaiian Archipelago. Spending a week investigating the natural history of any one of the main high islands of Hawaii provides for an exceptional learning. Having the opportunity to explore both Hawaii Island and Kauai as an expansive, integrated pro-gram adds another dimension – geologic time. The young island of Hawaii pro-vides the basic early setting, illustrative of the geologic origins of Hawaii’s giant mid-ocean shield volcanoes and initial settlement by native plants and animals. Kauai illustrates the result of 5 million years of geologic and biotic evolution during which time the island has interacted with the surrounding atmosphere, hydro-sphere and biosphere. Moving on over to Kauai the last three days of this program provide for observation of the maturing geologic and biotic effects of an isolated, trade wind-impacted, mid-ocean volcanic island that has interacted with the rest of the planet for over 5 million years. The geologic aspects of subsidence, weathering, erosion, soil formation, incision of canyons, growth of prominent shallow marine reef plat-forms, and the transport and deposition of sediments are all well displayed. Biotic evolution is dramatically revealed in a wide range of ecosystems collectively rep-resenting the highest levels of endemism on Earth. Darwin would have cherished this place.